We are passionate in creative UI/UX designs. We develop in native and hybrid for Android and iphone mobile apps. "Another great job by massoftware." 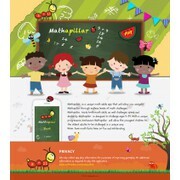 "App landing page for an educational math game for children. Massoftware was able to create a page that truly represented the spirit of the App. They were very responsive to suggestions during the design phase as well as during the handover phase. Res..."
"Great designer, fast to respond to requests and easy to work with. Very pleased with the results." "The designer did a great job making all changes requested and working in a timely manner. They were very professional and their work is outstanding. I would love to work with them again in the future and highly recommend their caliber of work to someone..."
"Great work! Looking forward to working with Massofware again." "Wonderful designer. We hosted a landing page contest and pretty much right off the bat massoftware's entries were much more creative and exciting than any of the others. In fact even the very first entry we receieved from massoftware we actually said to..."
"In addition to the design ability and professionalism of Kaushik, the quality of the final files is very high. There is a high level of organization, and even a design guide to assist in the slicing process. Very well done!"